Our Scented Wax Tarts are made with Kosher Soy wax and a tiny amount of natural Beeswax. Yes, this soy wax is the highest quality wax available. Our Scented Wax tarts use Our Essential oils and Our Oil Blends to make them. In fact, Penny makes them here. She makes them in small batches so they are fresh. IF you have a particular scent you would like us to make - just send us an e-mail and it might be available within a day or two. Just ask. We never know who might like a particular scent. We are happy to make you your favorite scent, as it might be someone else's too! Necessity for Tea Light Diffusers! As you know our oils are some of the highest quality essential oils. Our Scented Tarts being made using low temperature Soy wax, will melt quickly and allow the essential oils to start permeating the air quickly too. 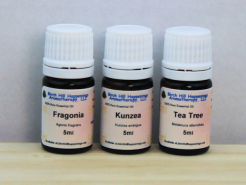 There is a lot of essential oil in each 1/2 fl ounce tart, we use between 1 to 1.25 ml per mini tart. Yes, when you buy one of our 3 fl oz mini tart packages you are getting between 6-8 mL of essential oil blended with the waxes. You only need to let them melt and heat for about 1 - 2 hours to have a very beautifully scented room. Then just simply turn off your oil/tart warmer. Please note that you may not smell the essential oils after 30 minutes or so as your nose becomes accustomed to the smell. The essential oils are still there scenting the room! When using the Tarts, we recommend you use one of the larger bowled Electric Oil/tart Warmers or the Ceramic or Glass Tealight Diffusers like the ones we carry as they will provide a large surface for the essential oils to be released into the air. You want about 1/4" to 1/2" melted wax in the bowl or about 2 of the mini tarts. Again this depends on the size of the warmer you are using. It may take 30 minutes to 1 hour for the wax to melt, depending on your current room temperture. You will only want to have your warmer to heat approximately 1 hour longer. The molten wax will continue to release the essential oils into the air until it once again solidifies. The next time you use the wax/tart burner you may want to add a few drops of essential oil or add another mini tart to refresh your wax warmers scent output. You can add more essential oils to any of the tarts if desired.